It is best for big size lenticular 3d+flip effects products,sure,it also support only 3d effects or flip effects(different angle can see different image) . Support indoor and outdoor 3d lenticular products. 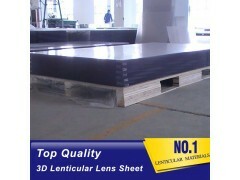 Lenticular lens board especially used for big format 3D advertisement, posters and lightboards with thickness more than 3mm. Lenticular lens board can be put in to decorative picture, outdoor Advertisement, light box, art crafts, and so on. PMMA lenticular board is especially for application of ourdoors, as it can withstand UV radiation and a wide temperature range. And PS lenticular board is usually used for indoors, the overall temperature range will be much less and the concern for UV radiation is greatly reduced. However, depending on your specific location, you may have to consult local fire codes for your particular application. Good quality, large format, high transparency, strong 3d lenticular effect, clear and not faint eye. Widely used in the 3d wedding photo studio, 3d advertising, 3d decorative painting and other industries.